We’d love your help. 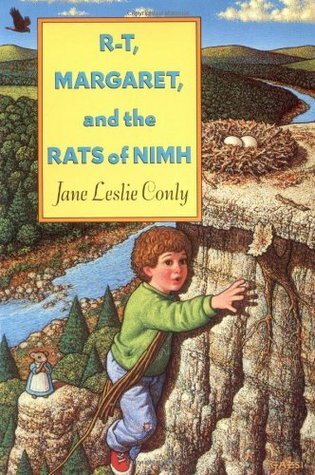 Let us know what’s wrong with this preview of R-T, Margaret, and the Rats of NIMH by Jane Leslie Conly. To ask other readers questions about R-T, Margaret, and the Rats of NIMH, please sign up. This wasn't as successful as the others for me. I didn't find Christopher as sympathetic a character. However, Margaret's realization at the end was quite powerful for me, "she felt what it must be like to be trapped once and for all. Inside a cage you wouldn't see the sun or moon, feel the earth under your feet, feel the rain or wind or dew. Of course they had run away. And she would do nothing else that would let them be found." I think that raised it to a 3 and a half for me. Read as a child and didn't realize it was a sequel at the time. It was difficult to catch on, but not to where I didn't enjoy the book. R-T can't hear. He doesn't fit in with the real world very well, when him and his sister stumbel upon the rats of NIMH, R-T finally finds a place to be accepted. I thought Patrick Rothfuss' The Name of the Wind was going to be my worst read of 2018. I WAS WRONG. R-T, Margaret, and the Rats of NIMH is almost unbelievably awful: a boring plot, massive plot holes, uneven pacing, characters that stray even farther from Robert C. O'Brien's original creations than the second book, new characters that are completely cringeworthy, child abuse and bullying presented in an uncritical manner, and a weird/stupid ending. The lowest of the low points for me is the mann I thought Patrick Rothfuss' The Name of the Wind was going to be my worst read of 2018. I WAS WRONG. R-T, Margaret, and the Rats of NIMH is almost unbelievably awful: a boring plot, massive plot holes, uneven pacing, characters that stray even farther from Robert C. O'Brien's original creations than the second book, new characters that are completely cringeworthy, child abuse and bullying presented in an uncritical manner, and a weird/stupid ending. The wonderful conclusion to the rats of NIMH story. In this instalment the rats stumble on two children lost in the mountains, Margaret and RT need help to survive until they can get home but after a time being with the rats starts to become "home" and second nature to them. When finally back in civilisation the rats warned them how hard it would be to keep a secret that big about the talking rats, both thought it would be easy but fitting in now with family and friends is hard as they have to kee The wonderful conclusion to the rats of NIMH story. When finally back in civilisation the rats warned them how hard it would be to keep a secret that big about the talking rats, both thought it would be easy but fitting in now with family and friends is hard as they have to keep lying about what happened in the mountains that summer. Will the children be able to keep quiet about the rats or will their cover be blown and NIMH will find out...? I loved Mrs. Frisby and the Rats of NIMH. This "sequel" just did not carry the magic from that book. The addition of humans to the NIMH story ruined it. And they were annoying humans. The ending was boring but the middle was alright. Last half was better than the first but we barely made it there. The book had some great elements but we didn't enjoy it as much as the first two in the series. this book is kind of weird and rambling at times yet at the end i'm still unsatisfied and want to know more about what happens to the rats of NIMH next. margaret is a complicated girl and i didn't really like her at first but i did feel bad for her since her mother(who by the way was a terrible character) fat-shamed her and i wish her arc had been written slightly differently to focus on her becoming strong and confident rather than lazy and selfish but not making it into a fat-to-skinny thing. this book is kind of weird and rambling at times yet at the end i'm still unsatisfied and want to know more about what happens to the rats of NIMH next. margaret is a complicated girl and i didn't really like her at first but i did feel bad for her since her mother(who by the way was a terrible character) fat-shamed her and i wish her arc had been written slightly differently to focus on her becoming strong and confident rather than lazy and selfish but not making it into a fat-to-skinny thing. i liked Artie and, not being an expert on disability politics, i felt like he was a positive representation of someone with either a learning or social disability, maybe on the autism spectrum? christopher and artie's friendship is really the only thing i had remembered about this book from childhood before re-reading. one other thing i have to comment on is the characterization of isabella--i can't decide what i think of her as a whole with regard to feminism in her efforts to change her image to be taken more seriously instead of like a girl who is infatuated with people. In this last installment of the Rats of NIHM series, our old familiar rats are joined by two lost children. R-T (Artie) and Margaret are taken care of by the rats and in return they help the rats with harvest etc. It is a beneficial arrangement, but one that can not last. Winter is coming and there is no way the rats can shelter the children from the elements. Each of these books is its own story. While the characters are the same and we see the progress, they each have their own plot and proble In this last installment of the Rats of NIHM series, our old familiar rats are joined by two lost children. R-T (Artie) and Margaret are taken care of by the rats and in return they help the rats with harvest etc. It is a beneficial arrangement, but one that can not last. Winter is coming and there is no way the rats can shelter the children from the elements. Each of these books is its own story. While the characters are the same and we see the progress, they each have their own plot and problem In this last installment of the Rats of NIHM series, our old familiar rats are joined by two lost children. R-T (Artie) and Margaret are taken care of by the rats and in return they help the rats with harvest etc. It is a beneficial arrangement, but one that cannot last. Winter is coming and there is no way the rats can shelter the children from the elements. The last NIMH book was just as adorable and sweet as the other two. The author's daughter did a really good job on the two sequels; I think he would have been pleased. This book didn't focus too much on the rats though, which was it's only downfall. We also didn't get to see my favorite characters, Timothy and Jeremy. Instead we mostly followed the lives of the two children who mistakenly wandered into the rat's community. This made it a different type of NIMH book, but different doesn't mean bad The last NIMH book was just as adorable and sweet as the other two. The author's daughter did a really good job on the two sequels; I think he would have been pleased. This book didn't focus too much on the rats though, which was it's only downfall. We also didn't get to see my favorite characters, Timothy and Jeremy. Instead we mostly followed the lives of the two children who mistakenly wandered into the rat's community. This made it a different type of NIMH book, but different doesn't mean bad. I wish there were more of these! This book made me a little sad. Not because of anything in it, but because I knew that after this, there isn't any more Rats of NIMH books and I can't explore this world any further. Initially, I was frustrated by the human focus, but the resolution of their personal growth and story arcs was very fufilling. I really did enjoy this book, even if mainly because it let me explore one of my favourite fictional worlds again. I didn't like this one as much as the others. It was still a good story and the characters learned and grew in interesting and meaningful ways. I don't care for the overall outcome and I'm less inclined toward stories that blend talking animals and people. It's more fascinating to me when the talking animals are isolated in their own little microcosim of a world. Adding human children into the mix with the rats of NIMH really starts to stretch the bounds of my suspension of disbelief. The levels of plausibility really start to break down, I think, and it's harder to sink into the story. Another difficulty may be due to the portrayed technology levels, which were perfectly fine at the time the book was written, but which date the book for readers today. I didn't know there was another sequel to Mrs. Frisby & the Rats of Nimh until I was a teenager. The end of the book ripped my heart out. It's one of the few times I can think of where I was so physically emotionally effected by a book. This one and Racso are sequels to the original. They were written by the daughter of the original book's author. I didn't realize that until I went to add them to my list. I remember enjoying them very much. This was my least favorite of the Nimh books because it focused mostly on the humans, who were at times, quite frustrating. It offered a different kind of story and perspective, but I wanted to see and experience more of the rats themselves, or the Frisby's! I loved The Rats of NIMH series, but the first was definitely my favorite! I was very disappointed in this book. I was really looking forward to it as a sequel, but unfortunately, it had none of the magic that Conly's father imparted in Mrs. Frisby. A heartwarming, adventurous, funny story about the little guy having really big adventures. I liked also, how is this one humans were let in on NIMH'S secret. this book is the suckiest book i ever read id rather read twilit. Will read this one for the September 2010 book club and the library. I hated having humans know the secret. The ending, though, was sort of mysterious and cliffy. Old Children's Book. Liked it as a kid, but haven't read it in years. I read this book to my 7 year old son, having read the first two NIMH books to him. He rated it 5 stars. Personally I'd give it more of a 3.5 rating. I was always dubious of this book. I was pleasantly surprised in the first half of the book, but then it fell away. The ending was stupid and I do not think this book should have been written. Daughter of author Robert C. O'Brien.